This huge barn of a church stands out on the corner of Queens Road in the south of the Borough, not far from the landmarks of the St Nicholas Hospital and the former gasworks. It was erected in 1878, and is so close to the other 19th century churches of St Peter and St John that it is hard to think that a church of this size was ever really needed, and you can't help wondering if some kind of turf war was going on between the various Anglican traditions in Great Yarmouth at that time. The materials are red brick and flint, and the architect was JP Seddon. A tower was planned on the northern side, but the money ran out. Interestingly, there was an earlier plan for the church, also by Seddon, in the 1860s, which would have seen a three-gabled west end in the style of the parish church of St Nicholas on the market place, but it also was never built. There were originally transepts here, but they were removed in 1908. The north side of the church is rather incoherent in comparison with the sheer face of the east end. The well-worked north entrance with its red brick orders and wrought ironworked doors, the sombre and impressive bell turret above, the broken line of nave aisle and chancel aisle, are all good enough in their way but they do not work together. Bill Wilson, in the revised Pevsner, describes the interior as huge even in its reduced form... one can hardly take it in from one spot. Sadly, it is not possible to test this judgement today because St James was declared redundant in 1999, and after lying empty for six years it was taken over by the Bridge Trust and divided up inside for office and work space for the St James Health and Resource Centre for Norfolk and Waveney Enterprise Services. There are some photographs of the interior as it is now on the NWES website, which says that the aim of the Centre is to encourage and support local community members, organisations, groups and businesses in the town. It provides both office space to local businesses and a number of support services to the local community. The building was refurbished with funding from the East of England Development Agency, the European Union, Heritage Lottery Funding and the Neighbourhood Renewal Fund. The war memorial window by Morris & Co is still in situ, although it is not clear if the great marble font which Bill Wilson saw is still there. 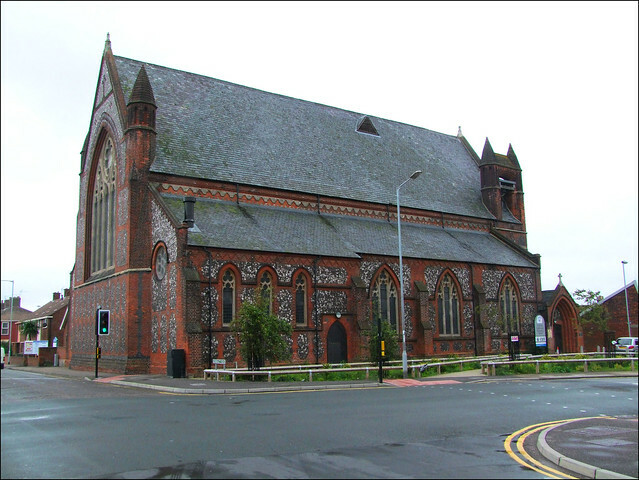 With the redundancies of the churches of St Peter and St John a short walk away, it means that all three great Anglican churches built in Great Yarmouth in the 19th century are no longer in use for their original purpose. As if to reinforce this sense of sic transit gloria mundi, the functional little parish hall to the south of this great barn is now the parish church, and is sole Anglican presence in the southern half of the Borough.